The Southeast Area Monitoring and Assessment Program (SEAMAP) is a State/Federal/university program for collection, management and dissemination of fishery-independent data and information in the southeastern United States. The organizational structure of the program presently includes three operational components, SEAMAP-Gulf of Mexico, which began in 1981, SEAMAP-South Atlantic, implemented in 1983 and SEAMAP-Caribbean, formed in 1988. 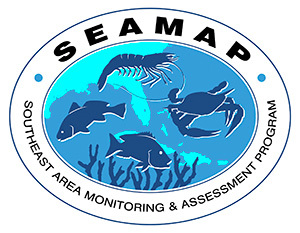 Each SEAMAP component operates independently, planning and conducting surveys and information dissemination in accordance with administrative policies and guidelines cooperatively established by the GSMFC and the National Marine Fisheries Service's Southeast Regional Office (SERO). Funding allocations to participants are administered through State/Federal cooperative agreements, managed by SERO and the Southeast Fisheries Science Center (SEFSC), National Marine Fisheries Service (NMFS). Activities and operations of each SEAMAP component are wholly defined by the respective managing units: the SEAMAP-Gulf Subcommittee of the Gulf States Marine Fisheries Commission's Technical Coordinating Committee, the SEAMAP-South Atlantic Committee of the Atlantic States Marine Fisheries Commission's South Atlantic Board, and the SEAMAP-Caribbean Committee of the Puerto Rico Department of Natural and Environmental Resources. The Gulf and South Atlantic committees consist of designated representatives from each member state and NMFS/SEFSC and the Gulf of Mexico and South Atlantic Fishery Management Councils. In addition, the SEAMAP-South Atlantic committee includes a representative from the Atlantic States Marine Fisheries Commission (ASMFC). The Caribbean component consists of members from Puerto Rico Department of Natural and Environmental Resources, Virgin Islands Division of Fish and Wildlife, Puerto Rico Sea Grant College Program, NMFS/SEFSC, U.S. Fish and Wildlife Service, and Caribbean Fishery Management Council. Each committee meets yearly to review operations, examine priorities, and plan future activities. Daily operations are carried out by the respective SEAMAP coordinators, assisted by staffs of the two Commissions and Puerto Rico Department of Natural and Environmental Resources and personnel associated with the SEAMAP Information System, SEAMAP Archiving Center and SEAMAP Invertebrate Plankton Archiving Center. Surveys by each program component reflect distinct regional needs and priorities; however, survey operations in one geographic area often provide information useful to researchers in all three regions. For instance, the South Atlantic program's Bottom Mapping will be useful in SEAMAP-Gulf gear calibration efforts, while plankton and environmental surveys in the Gulf program have set the standards for the entire region's much-needed long-term data base. In the Gulf of Mexico, SEAMAP resource surveys include the Fall Shrimp/Groundfish Survey, Spring Plankton Survey, Reef Fish Survey, Summer Shrimp/Groundfish Survey, Fall Plankton Survey and plankton and environmental data surveys. In the South Atlantic region, surveys include Shallow Water Trawl Survey, Pamlico Sound Survey, Benthic Characterization, and Bottom Mapping Project. In the Caribbean, the Reef Resources Survey is conducted. In addition to the regularly-scheduled surveys, SEAMAP participates in a variety of other projects such as the Winter Trawling and Fish Tagging Cruise, a coordination role for developing finfish bycatch estimates. The SEAMAP provides guidance, personnel, and other contributions to these studies for enhancement and protection of the marine resources. Information from the SEAMAP activities is provided to user groups through three complementary systems: the SEAMAP Information System, the SEAMAP Archiving Center and the SEAMAP Invertebrate Plankton Archiving Center. Products resulting from SEAMAP activities can be grouped into two major categories: data sets managed by the SEAMAP Information System, the SEAMAP Archiving Center and the SEAMAP Ichthyoplankton Archiving Center and program documents. If you need additional information concerning this program, please contact Jeff Rester at the GSMFC office at (228) 875-5912 or via e-mail.